Getting some kids to open up and talk can be like pulling teeth. They don’t always have insight into what they’re thinking and feeling and find it hard to express themselves to others. Psychotherapists discovered that using mandalas with kids can help them develop a better understanding of themselves and their experiences. 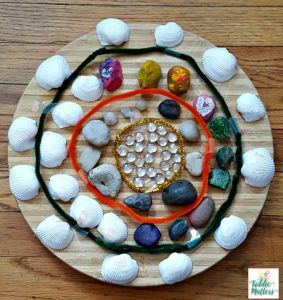 Mandalas are helpful because they give kids an opportunity to explore their thoughts and emotions in a creative, non-threatening way. Mandala is a Sanskrit word that means “sacred circle.” It is also symbolic of wholeness and unity. For centuries, many cultures and religions have used mandalas for visual meditation and for creating art. Today, Mandalas are also used as creative tools in counseling to encourage self-expression and self-reflection. Once you decide what you will use as the base of your mandala, you will want to draw circles on your base. We used different color pipe cleaners to make our circles. 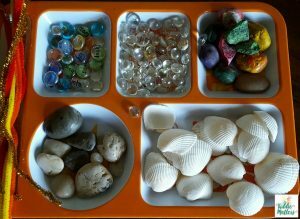 After the circles were completed, the kids used rocks, shells, and glass gems to design their mandalas. Since the aim of this mandala activity is to teach kids to self soothe, I played relaxation music as the kids worked on their mandalas. The kids focused and stayed in the present moment while they worked on their mandalas. They were instructed to let their thoughts and emotions flow through them. They were not allowed to dwell on or judge their thoughts and feelings as they made their mandala. They were also told to bring their attention back to the center of their mandala if their mind started to wander. When the kids finished making their mandalas, they spent time looking at their creation in silent contemplation. The kids also had to explain what their mandalas say about them. For instance, we explored the colors and material they used and what that reflects about how they are feeling on the inside. 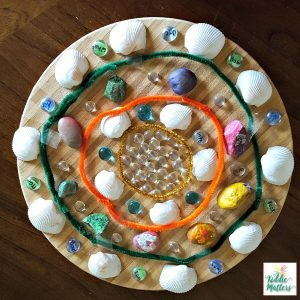 Mandalas are great to use with kids because they get to enter their inner world in a creative way. 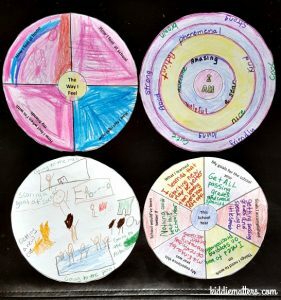 Below are mandalas with different prompts designed to help kids explore their thoughts and feelings. 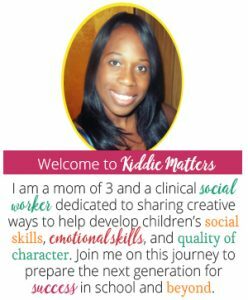 These come from the resource Mandala Social Emotional Learning Activites. Working with mandalas is fun and engaging for both kids and adults. 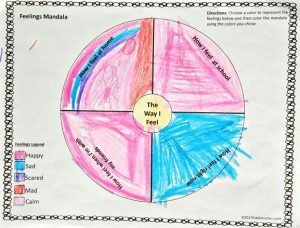 Have you used mandalas with children? If yes, I would love to hear how you used the mandala!